Item shown above : Black FINISH Natural Hardwood with a glossy protective lacquer coating (Baseball and cubes not included). Hold balls with or without cubes. The picture speaks for itself. The item is so well-made. This item is sold exclusively here. 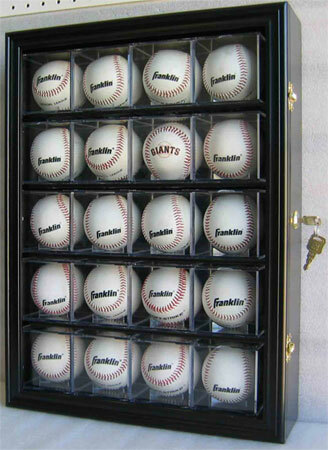 It can be used to display MLB baseballs, baseballs in cubes or NHL hockey pucks. Made from hand selected hardwood. Repeated sanded to achieve smooth and elegant appearance. A great way to display your baseball, hockey puck, or tennis ball collections. Black matted background and Hinged door to protect from dust and damage. Brass hinges, door latches, and wall brackets to hang (Wall mounted). Holes on shelves to secure the balls from rolling. Comes with Lock and 2 keys. No assembly required.